The Mexican sage plant is a hardy perennial bush that grows to a height up to 39 inches. This sage variety is hardy to plant in USDA growing zones 8 through 10 but can be planted as an annual in colder climates. Mexican sage produces long leafy stems with tall spikes of flowers. The plant is attractive when planted in large groupings or as a border. Choose a planting location for a Mexican sage plant that has a well-draining, sandy loam-type soil and full sunlight for six to eight hours each day. Test the soil pH of the planting area as Mexican sage grows best in a pH of 4.5 to 8. Add ground rock sulfur and work it into the soil to lower the pH number. Water the planting area well after amending with sulfur and let it rest for two weeks before planting. Plant the Mexican sage plant in a hole that is the same depth and twice as wide as the container the plant came in. Amend the removed soil by mixing in organic compost to increase the soil nutrient value and moisture retention ability. Set the plant into the hole and fill amended soil around the root ball. Gently pack the soil in place to remove air pockets. Water the sage generously after planting to stimulate root growth. Space Mexican sage plants at a distance of 18 to 24 inches. Water the Mexican sage plant each week to keep the soil moist during the growing season. The plant does not respond well to dry conditions. Fertilize the Mexican sage plant twice a month during the growing season with a water-soluble fertilizer designed for annual and perennial plants. Cut to remove flower clusters once they begin to fade. Prune back the Mexican sage plant in early summer by removing 1/3 to 1/2 of growth throughout the entire plant. This will promote bushy growth and prevent stems from breaking due to excess weight. Propagate the Mexican sage plant by taking stem cuttings in midsummer from new growth. Dip the cut end in rooting hormone and stick the cutting in a tray filled with equal parts peat moss, coarse sand and perlite that has been moistened with water. Place the tray in a warm location with indirect sunlight until roots have formed. Mexican sage can also be propagated by removing root and stem sections that are touching the ground and forming roots. Plant the rooted sections in a container or directly into a garden bed and water well to keep the soil moist. 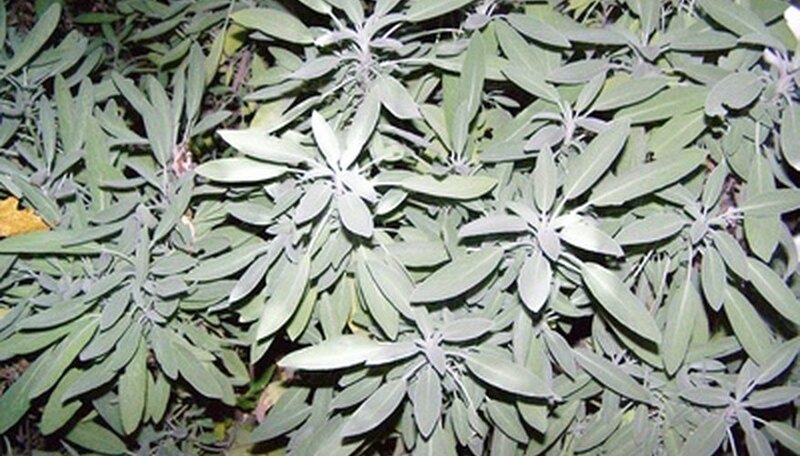 Monitor the Mexican sage plant for the formation of the fungus infection leaf spot. Symptoms appear as brown spots with dark centers on the leaves and stems. Remove and destroy infected stems and leaves and rake up any that have fallen to the ground. Prevent and control a leaf spot infection by keeping the plants healthy with adequate water and fertilizer applications. Water at the ground level instead of spraying plants, which splashes fungal spores to other plants.